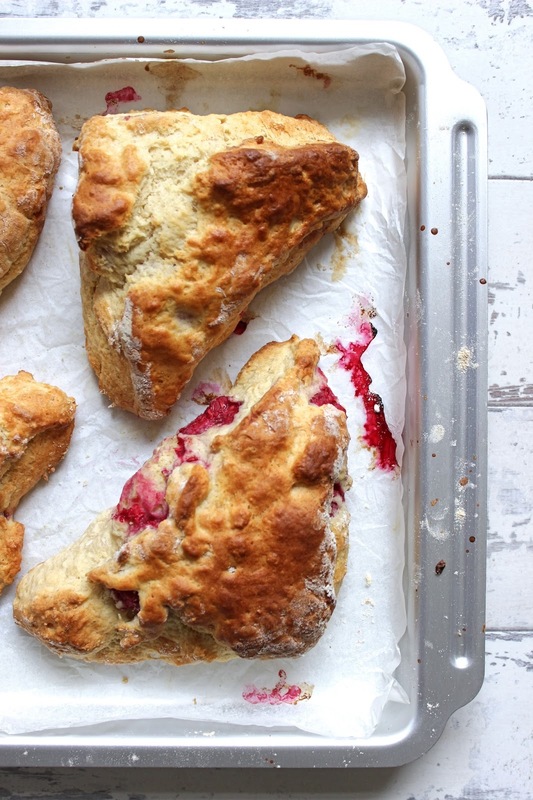 After going berry picking the other week and being left with an abundance of raspberries piled in the fridge I had to find some way to use them up and raspberry scones seemed like the perfect idea. Not far from where we live there's a garden centre and inside they have the most amazing little cafe. Its a small cafe, every thing's handmade, really fresh and well pretty much everything is delicious. When I was little my favourite thing to order was a chicken sandwich that came with a little bit of salad so that I could always have some of the amazing homemade dressings. After it I'd always have a huge hot chocolate with lots of cream and gooey marshmallows...but I'm getting off topic now -back to the scones! They have a few different flavours to choose from but if they have berry and white chocolate they are always my go to so I thought I'd give them a try at home and use some berries in the process. Pre-heat your oven to 220 degrees (Celsius), line a baking tray with greaseproof paper and weigh out all of your ingredients. In a large bowl, add your flour and baking powder then add your butter and rub it in with your fingertips until it kind of resembles breadcrumbs. Then tip in your sugar and mix through. Make a well in the middle of your floury breadcrumb mix and pour in your beaten egg, half of the milk and start to mix together -trying to work the mixture as little as possible. I like to use a knife to do this. Add the rest of your milk little by little until you have a soft but not sticky dough -scone dough should never be sticky. Turn your dough out onto a floured surface, knead lightly and then roll or press it out until you have a rectangle shape between 2-3cm think, then cut into two equal halves. Add your berries to one half of your rectangle and then top with the other -I find this to be the easiest way to get berries into your scones without them breaking up. You can now cut your scones up however you'd like, and the amount you end up with will depend on the size you go for, if you go small you'll get around 12, if you go big you'll probably end up with half that amount. Feel free to use a cutter but I decided to cut mine into large triangles...no waste and I think they look pretty cool. Pop them on your baking trays, brush them with a little milk and then they can go in to oven. Again, the time will depend on the size around 8-10 minutes for small scones and around 15 minutes for large. All you have to look out for is them being well risen and a pale golden brown. When ready just leave to cool on a wire rack. Melt your white chocolate and then with a spoon drizzle little by little over your now cooled scones and that's you done! I never think scones keep very well so eat as soon as you can, and at least withing 2 or 3 days but fresh is always best -with cream and jam of course!